A miniature silver box of circular form, with straight sides and a slightly convex top and base section. The top and base of the box are decorated in repoussé with minutely detailed, mirrored patterns of formal scrolling foliage and stylised flowers arranged around a central flower, all on a background of tiny ring punches. The sides are similarly decorated with rows of trefoil plants, also on a ring.punched ground. 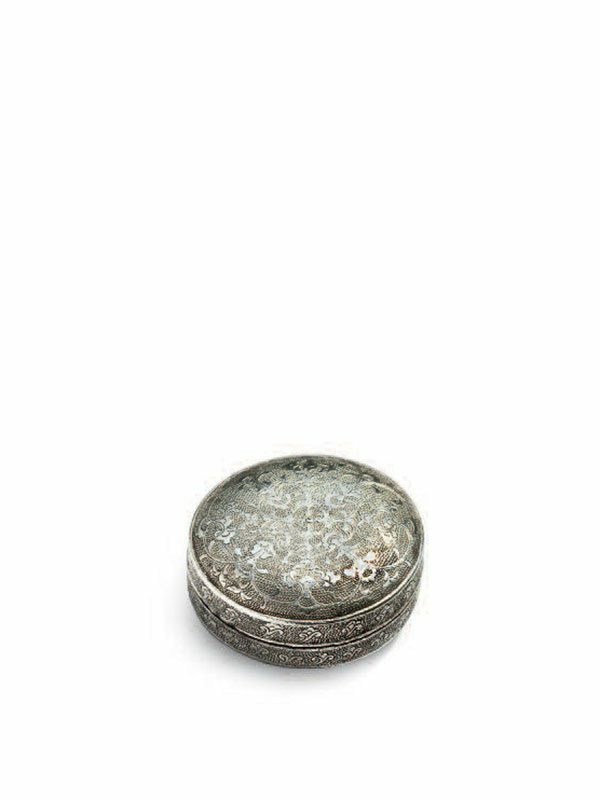 This elegant, beautifully decorated miniature silver box, representing the finest quality of silversmithing during the Tang dynasty, was probably made as a container for cosmetics or patches. 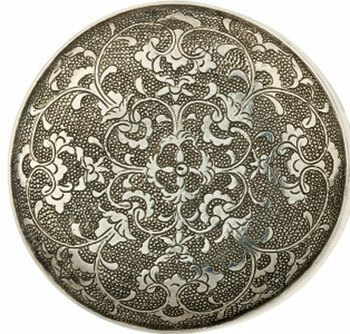 The decorative design is typical of Tang silver; the tiny ring punched background is a distinctive feature seen on silver objects of the period. The tight curves of the stems and the density of the design are characteristic of ornaments of the late 7th and early 8th century. Miniature boxes with flat lids were first produced during the early part of the Tang dynasty, becoming popular by the mid 8th century. A slightly larger Tang dynasty silver box of similarly intricate, symmetrical leafy design was formerly in the collection of Mrs. Walter Sedgwick. Another larger Tang dynasty miniature silver box with a closely comparable decorative design, including a central floral motif, is in the Muwen Tang collection. A further comparable example of slightly smaller size was formerly in the Carl Kempe collection.